When, on the 27th August 1576, the ancient Venetian artist Tiziano Veccellio—known in English as Titian—breathed his last, his fellow countrymen would have mourned him more deeply. However, he was just one of an estimated 50,000 Venetians who died of a virulent plague between 1575 and 1577, about one third of the city’s population and more than the current number of people resident in Venice. Tiziano Veccellio’s Assumption of the Blessed Virgin Mary. By the autumn of 1576, the Doge and the Senate of Venice were desperate. The plague showed no sign of abating and none of the quarantines and countermeasures they had in place seemed to be working. Feeling utterly helpless in the face of this act of god, they did the only thing they had left to do. They prayed. Doge Alvise I Mocenigo, proposed to the Senate that they make a pact with God. If he took the plague away, in return they would build a brand new church, dedicated to Christ the Redeemer (Il redentore). Then, a solemn procession incorporating the Doge and all the government, would visit the church every year on the anniversary of the end of the plague, accompanied by a general festival of thanksgiving. On 4 September 1576, the Senate approved the plan and the contract was made. A site on the island of the Giudecca was set aside for the new church. Then they waited. They waited through the long winter of 1576. Then, in the spring of 1577 signs came that the plague was dwindling, and then finally by the beginning of July the city was declared plague free. Unfortunately, Doge Alvise I Mocenigo didn’t live to see the end. He died on 4 June 1577 and was replaced on 11 June by Sebastian Venier, hero of the Battle of Lepanto. Venier quickly moved to carry out Venice’s side of the bargain and it was decided to commission the new church from Andrea Palladio, one of the most famous Venetian architects of his generation. Doge Sebastian Venier’s bust in the Doge’s Palace. Palladio was known mostly for designing the luxurious mainland villas to which the Venetian nobility repaired in the summer months and in time of plague. He must, therefore, have seemed the obvious choice. Although all of his many buildings were constructed within the Venetian Republic, most of them are in Vicenza and very few of them are in Venice itself. His Venetian commissions included a new facade for the Cathedral of San Pietro di Castello, the refectory of the monastery on the island of San Giorgio Maggiore and later the church itself, the facade of San Francesco della Vigna, and possibly the church of Le Zitelle on the Giudecca. Andrea Palladio’s church of San Giorgio Maggiore. Neither Doge Venier, who died in 1578, nor Palladio, who died in 1580, lived to see the completion of the Chiesa del Redentore. It was dedicated in 1592 and has been the site of the festival of thanksgiving ever since. A date of the Saturday before the third Sunday in July was fixed for the celebration of the festival. This is not necessarily the third Saturday in July because, as in this year, the first Sunday could be the 1st July. And it’s been carried out in pretty much the same way ever since. Building the pontoon bridge outside the Chiesa del Redentore in 2017. Since the Giudecca is separated from the rest of Venice by a large body of water (the Giudecca Canal), a pontoon bridge is built from the Zattere in the south of the city, to the Chiesa del Redentore. At 7pm on the Saturday evening, in the presence of the Patriarch of Venice, the bridge is opened to the public who cross over to the church, admiring the unusual views that they can usually only get from the vaporetto and going into the church to pray. The pontoon bridge from the 2017 Festa del Redentore. 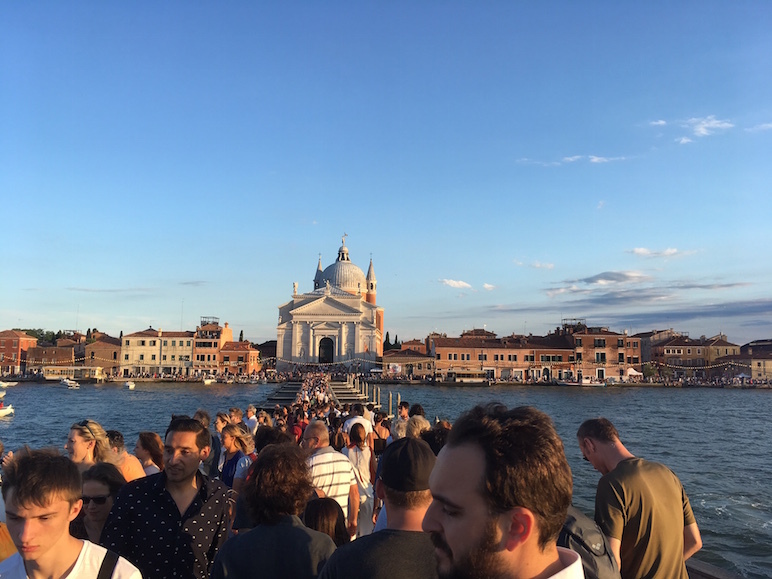 During the evening, people will come into the Bacino di San Marco and the Giudecca Canal in boats to eat waterborne picnics and wait for the main event: the 23.30 firework display. On the afternoon of the Sunday there are boat races, and then the festival culminates on Sunday evening with a mass, celebrated by the Patriarch, in the church itself. Boats in the Giudecca Canal for the 2017 Festa del Redentore. The firework display from the 2017 Festa del Redentore. If you’re lucky enough to be in Venice on Saturday 15 July, you’ll get to witness this most Venetian of festivals, which really is not to be missed. Despite the huge crowds, the festival has a real atmosphere of joy and celebration. For Venetians, it’s a time to re-connect with the long line of ancestors who have celebrated this festival over the last four-hundred and fifty years; for tourists, it’s an opportunity to see a remnant of Venice’s past glory. More fireworks from the 2017 Festa del Redentore. Don’t look up, look down! I think that Venezia should keep the pontoon bridge erected during the period the huge cruise ships come in. They are a scourge on the City and the residents like a “plague”. This way the cruise ships can’t get into the port! Take their “Disneyland” seeking tourists to Ravenna or Trieste; If they want to see Venice, come in by train. If they’re hungry, they’ll eat at Venetian restaurants!